Leba Systems are NSI Gold Approved and can provide all your door entry requirements to ensure only you or your staff gain access to your property, we offer an effective way to track and manage you staff and visitor traffic. Smaller sites that have a small number of users can benefit from this type of system. It can be used to gain access to one or more doors within a building. 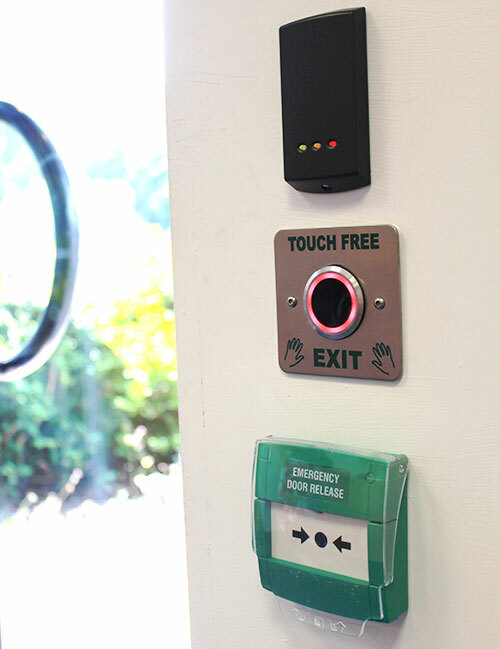 Access is granted via a keypad, magnetic strip or proximity tag (depending on the type of reader installed) management of the system is straightforward and can be extended easily as your requirements change. These systems are ideal for medium to larger sites they offer central control, via a network and can be integrated with CCTV, intruder alarms and other systems providing reports of staff and visitor movements within the premises. Access is granted via a keypad, magnetic strip, proximity tag or “hands free” token. It is easy to control and enables access to certain areas to be granted to different groups. Management of the system is straightforward and can be extended easily as your requirements change. Our systems range from specialist PC based multi door, Net 2 Paxton Access systems with proximity readers, systems for multiple occupancy buildings, to simple one door push button entry system. We can offer a full line of readers ranging from proximity, keypad, magnetic stripe, bar code and biometric.